I heard a fire truck siren last night. This maybe isn’t all that noteworthy but for the fact that I actually stopped and noticed. We aren’t exactly what you call urbanites, in that we don’t live in an area where public transportation is the primary means of getting from point A to point B, but we aren’t exactly suburbanites either. We’re about as close to being city dwellers as you can be and still have a decent backyard. But being this close to the city also means being this close to the drama a city attracts. There is an apartment building directly across the street from us where we have witnessed drug busts on more than one occasion. The first few times all the requisite emergency vehicles pulled up practically in front of our house we were adequately concerned and went to find out what was going on. But when this happens over and over and over you sort of learn to tune it out. We had friends over for dinner the other night when all the various sirens started blaring in our front yard. Our friends were concerned. I hadn’t even heard it happen. So when I noticed the siren last night I was surprised to find that it made an impact on me, as though I needed a wake-up call to notice other things too. There are certain sins in both my family and myself that I just sort of tune out. They don’t prick my heart like I remember them doing in the beginning. Time and repetition has taken away the concern and I haven’t even noticed. I’ll tell you this one thing: I am tempted to despair quite often. And I see the guilt within. But what I forget to do is upward look and see Him there, who made an end to all my sin. Sometimes I need to be snapped back into looking up, to see the great unchangeable I AM: Christ, my Savior and my God. I thought I could get away with just writing about something as trivial as a piece of kitchen gadgetry tonight, but I’m not sure I really can. I’ve got some issues I’m not sure even I know how to properly name. I think it might have something with sending two of my kids off to school this year. There is this lie I am choosing to believe that I am a parenting failure by not continuing to homeschool all four of my kids. And I’m a bit conflicted in my role as a director of a homeschool program. A pretty successful homeschool program. An emotionally demanding homeschool program. I saw my two oldest kids for about a total of 20 minutes today. I did not like that one bit. I took a peek at the math book my 5th grader brought home tonight. So I feel guilty for sending her to a school where they do a math program I’m not a fan of. Because I’m rational like that. My two youngest finished all their school work today in about four hours. And I kept thinking we were missing something. So there’s guilt with that. Even though I probably did more with those two today educationally speaking than I’ve ever done with them. But I have to feel this guilt. I had a fair amount of hard parent conversations last week about my homeschool group. I cried myself to sleep one night last week because of it. Because I hate making decisions that other people don’t like. Because my heart is sad when not everyone agrees. Because I like everything to be pink and covered in rainbows. But the more people who gather together, the more likely I’m going to make somebody really mad about a program decision. And when they get mad I get sad. And then I have to wear my new t-shirt. My friend Becky designed the shirt for me after I joked in an email that I wanted her to do it. I think maybe she was afraid I would take it personally if she didn’t. She designs other cute stuff. I like to make cute stuff. I made my girls some cute book covers for school. But one I made tonight was too small and it ripped when I tried to slide the book on it. It’s Monday night and it’s the end of the third day of school. No doubt by now you’ve heard of the infamous JetBlue flight attendant who slid his way away from frustration and his job. No doubt you’ve heard how many people are cheering him on for what he did, as though he took the hero’s route. Turns out, he may not have been as much of a hero as they want him to be. Something similar went around the Internet about a girl who quit her job using a dry erase board and a series of photos to explain why her boss was such a jerk. This one turned out to be a hoax, but the response from those hoping she’d really done it was mind-boggling. How quickly we seem to be losing our civility. Would it have killed the airline attendant to at least have finished out his shift for the day? He could have just as easily waited, gone to his supervisor and turned in his name tag. Granted, there would have been little to no fanfare in this, but it would have been the proper thing to do. Likewise, the idea of using a dry-erase board to tell off her boss and quit her job just seems so over-the-top. Of course, she didn’t really do it, but so many people were hoping she did (and I’d be willing to bet that someone actually will very soon – watch for it). Is this what we want to be teaching our kids about conflict resolution? Life isn’t about doing the thing that makes the most people go, “YEAH!” It’s about doing the right thing regardless of how it makes you look to others. Doing the right thing will seldom land you your fifteen minutes of fame. But it probably won’t land you in jail either. looms ahead and the schedule turns crazy. off to a traditional school setting come next Thursday. different ways we can package a PB&J and still make it palatable. and back in May, August seemed a long way off. Yet here we are. August 11.
proceeded to enter all the new events into our family Google calendar. New friends, new opportunities, new growth. Hello, August 11. Let’s do this. Or, more precisely, a room to dream in. Remember this contest? 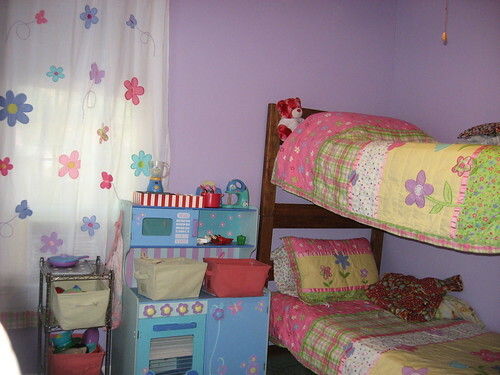 The one in which I asked all my online buddies to vote to get my girls’ room painted for free? Remember this photo? That’s the color. It’s beautiful and we all LOVE it. And, from a quality perspective, I have to tell you – the paint job is excellent. You see that radiator in the corner in the first “after” photo? I’ve personally painted two rooms in this house with those types of radiators and they are seriously hard to paint behind. 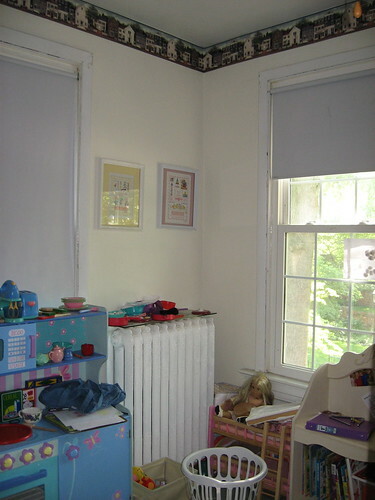 In fact, in the two rooms I personally painted, I was not able to completely get behind said radiators. And I wouldn’t have faulted them one teensy bit had they not gotten all the way behind it either. But they did. They are the David Copperfield of painting. I’m serious. Except that what they did was no illusion. It’s both amazing AND real. 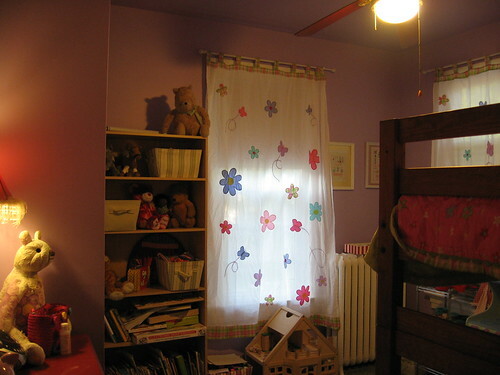 So I have to say it again: thanks, thanks, thanks to St. Louis Sprout and About for taking a chance on holding a contest like this, and thanks, thanks, thanks, to the good folks at Dettmann-Clause Painting Company for giving my two youngest girls a room they can dream about. And in.